With warmer weather just around the corner, it’s time for some spring cleaning. And that includes email design! 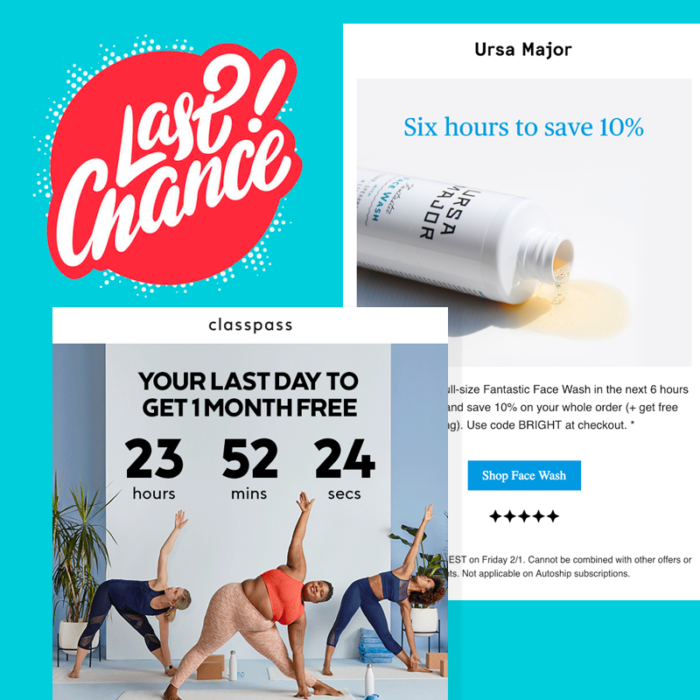 Minimalism has been on our radar as one of 2019’s email design trends, and we’re finding excellent examples of simpler, bolder, ultra-focused emails in our inbox. 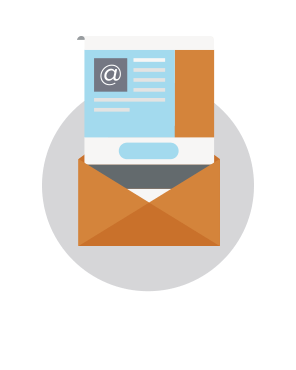 Minimalist email design is so effective because it communicates simply and beautifully. Design and copy work together to deliver a message that’s cohesive, quickly comprehended, and enticing. So check out these seven types of minimalist emails and get ready to be inspired. Maybe they’ll even spark joy! 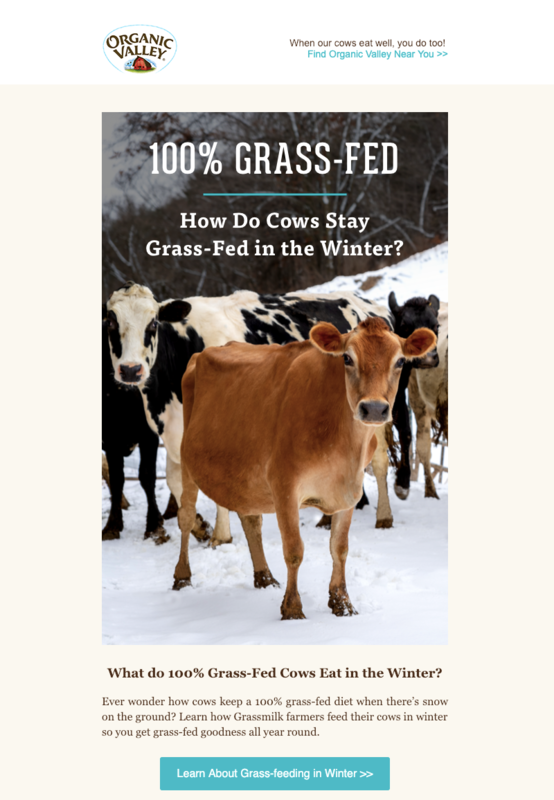 Subject: 100% Grass-Fed. In Winter? The takeaway: Let your customers speak for you! 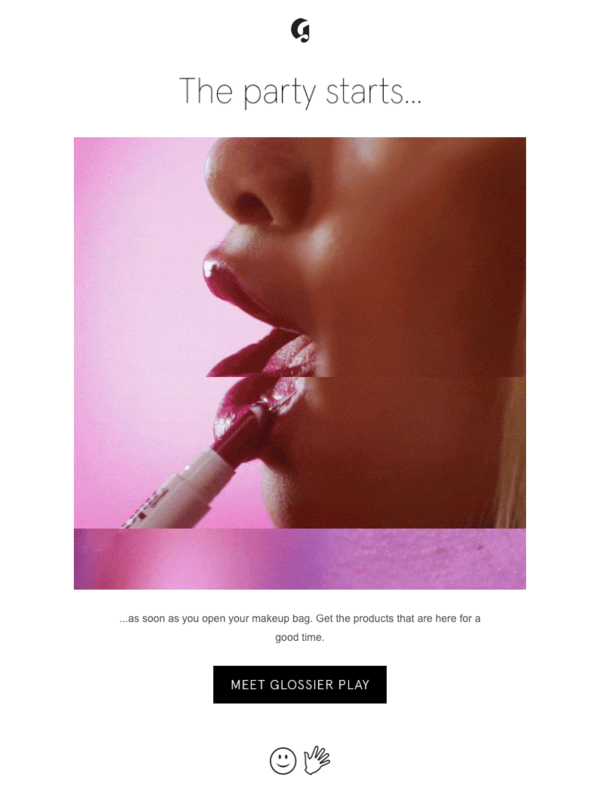 Don’t hide user-generated content at the bottom of your email; let it be the main dish. The takeaway: Heighten intrigue with a single GIF or image and just one line of text (and give away an exciting hint with your CTA button copy). When your minimalist email marketing also builds suspense, customers will be much more likely to engage with your CTA. This is one of the longer emails in our collection, but there are still plenty of minimalist graphic design decisions at play. Each module maintains the same layout: side-by-side images followed by a quote and button against a muted pastel background. As you scroll, you know what to expect. The photos are all cropped the same way, the colors work together, and the quotes are short and legible in a large font. There’s no clutter to be found here! 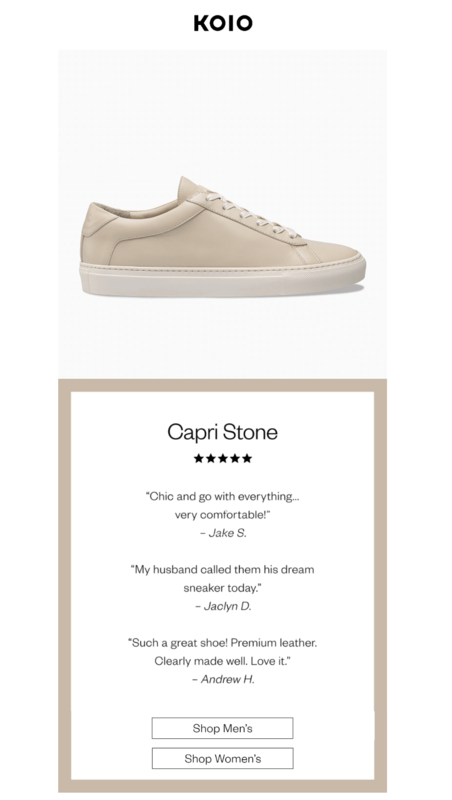 The takeaway: When you’re creating a minimalist email newsletter, build a simple module with only the most essential content, then replicate it throughout your email. This invitation email from Everlane has a lot of content (normal for invitation emails, which must include logistical details), yet minimalist design decisions have been made. There’s a large, easy-to-read header, followed by a single image that helps readers “see” the event. There’s a chance to RSVP at the top with a button, then a second module with supporting information like location and timing, followed by another CTA. Between everything is ample padding. The email doesn’t feel too crowded, and its focus is clear. Plus, the banner along the top acts as a TLDR version of the entire email. The takeaway: Use a large font size and plenty of line breaks in your invitation email so it’s scannable. Have we mentioned minimalist emails can be colorful? 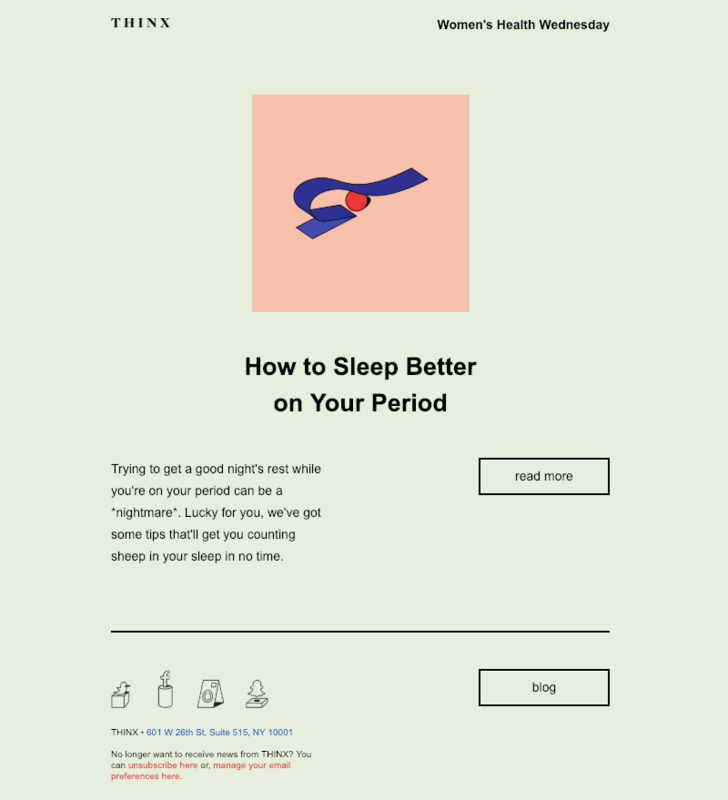 This lovely green email from THINX employs a minty HTML background color that stands out in our inbox. We love the live text used here and the stylistic choice of using a two-column layout for the body copy and CTA button. It looks different from other emails, but it’s still stunningly simple. Plus, this email is about only one thing. There’s no product promotion here, or even a link to second article. There’s just one topic, and that simplicity drives home the message. The takeaway: Deliver blog content with a single, simple teaser message that invites readers to click for more. And don’t be afraid to go all-out with a beautiful background color! PS — Want a leg-up on minimalist email design with simple, responsive HTML email templates for business that you can download for free? The BEE editor has dozens of product launch templates and more when you sign up for a free BEE Pro trial. Get creative, choose an email template and customize it however you like!